We have incorporated a hip app, HipChat, into our workflow in an interesting way. HipChat is a product that can be used for presence, chat and file transfer. HipChat has the notion of different “rooms”. As you can see below, we have rooms for sysops (servers crashing), an activity stream and a “new Jira issues” stream. We use Jira as our tracking tool for our development process which I wrote about a few weeks ago. 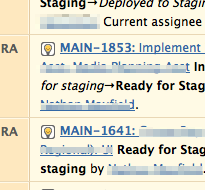 When someone creates a new issue, it shows up in the HipChat “new jira issues” room. When someone moves an issue to the “Waiting for approval from Product” state, it shows up in the “activity stream” room. HipChat has Windows, Mac and mobile clients, so you can watch for new issues while you are having a romantic Italian dinner in the North End. It’s a big hit with the wife. I know.